The first parts of Dream Catcher are excellent. The author references her father’s books and short stories a lot and looks for interpretations. She talks about his background, him meeting her mother (who was British, having been evacuated to New York during the war) and them looking for a house in Cornish. There is a lot about anti-Semitism in American life and universities and how this played a part in the bitterness JD Salinger displayed towards establishment types and educational institutions in his work. The Catcher in the Rye was based on his experiences of military school and just like Holden Caulfied he really did accidently leave all the fencing equipment on a subway once. There is some fascinating detail about his time in the war too and how it haunted him forever. The author tells us her father was a staff sergeant and counterintelligence officer in the 12th Infantry Regiment and survived the carnage of Normandy, the Hürtgen Forest and the Battle of the Bulge. His regiment suffered ‘125 percent’ losses in their first ten weeks of action. At this point you think Dream Catcher is going to be a great book. 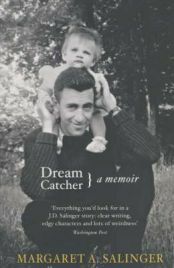 A biography of JD Salinger by his daughter – she even aims a few swipes at books like Ian Hamilton’s In Search of JD Salinger for being full of nonsense and speculation. It becomes less interesting though as JD Salinger begins to feature less and less and it morphs into the autobiography of Margaret Salinger with endless (self-indulgent) details about every boyfriend she ever had, every friend she had at school, every illness or sniffle, how she had trouble with heights and would pass out on school walks in the hills. We actually have to read tedious notes and letters that were passed to and from the author and her schoolfriends in the sixties (‘Dave and others were friends with me yesterday and now they don’t even know I’m alive’) plus some school reports. Dream Catcher could have easily lost a hundred pages (my paperback copy is 450 in total) and the author waffles on about irrelevant details in her own life for far too long at times. Dream Catcher is generally well-written (if a tad pretentious in places) but there are a ridiculous amount of footnotes and quotes from poems and sociological textbooks that disrupt the flow of your reading at times. There is undoubtedly some fascinating stuff here though. JD Salinger was into homeopathy and followed Buddhism, Christian Science and Dianetics at various points. He drank his own urine and sat in an ‘orgone’ box. The author never seems terribly impressed when remembering all of these things. ‘My father was often pointedly irritable or tactless in the thralls of his private fads. I never questioned his judgment, I just had a pervasive, creepy feeling that something wasn’t right, that something disturbing and spooky was going on.’ Although Margaret Salinger comes across as very likeable in the memoir and has obviously had a lot of problems in her life (chronic fatigue syndrome, losing a baby) it’s hard to relate to her when she writes about being left enough money not to have to work for several years and flying to Paris alone at 15 to see a boyfriend. I did though enjoy her moving tribute to a late teacher and her memories of going to Woodstock are really good to read about too. ‘I surely need a piece of Woodstock to get me through the evening news sometimes. Remembrance of sweet apple blossoms and bees, dancing in the rye.’ She writes about how her father used to run old films on a projector with The 39 Steps his favourite. He took her and her brother Matt (who became an actor and played Captain America!) to Britain in the sixties and visited London and Scotland on the trail of locations from the film. The author remembers loving the green parks and wandering down Carnaby Street to look at the fashions. JD Salinger had separated from their mother (who was now apparently sleeping with half of New Hampshire including the students) and had another reason to visit Britain. ‘The only not so fun part of the trip was the main reason he had come over. He had been corresponding with a teenage girl and things had blossomed into a pen-pal romance. He was to meet her for the first time.’ Her father is mortified when the girl turns out to be plain and ‘homely’ and has no interest in her. Dream Catcher is an often engrossing book with some great stuff but suffers somewhat whenever the author’s famous father (who, let’s be honest, is the main reason why anyone would buy this) is absent. The many details about him are always compelling though. Even little things like what food he liked to buy and how he had a tiny cabin deep in the woods where he wrote Franny and Zooey. A tighter and shorter version of this would have been better. I should mention in closing that Dream Catcher contains a number of black and white photographs of the author and her father and some of these are very interesting. No Comments on "Dream Catcher"